I am so trilled and honoured to share this with you. 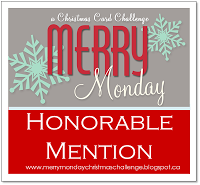 Last week for the Merry Monday #145 Challenge the card that I submitted won an honourable mention. I am so humbled to have been chosen out of so many beautiful cards, and want to extend a huge THANK YOU to the design team that voted for my card and to all those who posted wonderful comments on my card! To see my card click here.